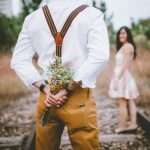 Match.com Review - Is this dating site worth it? Match.com Review – Is this dating site worth it? If there were such a thing as a titan of the online dating world, it would be this one. As one of the largest and most popular online dating sites in existence, Match.com had some seriously big shoes (or glass slippers if you’re a romantic) to fill. But no pressure, right? Well, either way, we were ready to find out by finally tackling our Match.com review. In the coming sections, we took the lid off of this dating site giant and broke it down into a bunch of little small pieces. Our goal with our Match.com review is to try and give you the most honest and accurate picture of what to expect here. 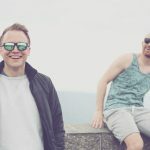 We assume you’ve come here wondering if this site is worth your time, money, and effort and we want to answer that question. Our Match.com review is one of the most honest, accurate, up to date, and downright blunt reviews you’ll ever read. We couldn’t care less if we upset the site or we win a spot on their Christmas card list with our review. All we care about is getting you the most accurate picture of what to expect so you can make an informed decision about your time and your money. Here are the sections we’ll cover in this review. Are there good, quality matches? Tell me about customer support. Without any further ado needed, let’s get started! This is always one of the most important questions that people want to get answered. Are there lots of awesome singles on this site or is it filled with fake profiles, flakes, and creepers? For that reason, it’s right where we decided to start our Match.com review. When we logged on to check out the site for the first time at 2pm on a Friday afternoon, there was a note that said there were 126,874 singles currently online! Whoa, that’s an incredible number and this site already has our attention about 5 minutes into our Match.com review. While most sites don’t post this information, the ones that do are usually in the hundreds and maybe low thousands but never anywhere north of 100k. Match.com is off to a nice start. But, just because there are a lot of people using the site doesn’t mean they’re quality. Sure, Match.com already passed the quantity test with flying colors, but what about the quality test? Well, here’s what we did to find out and what we saw. We began running “test searches” in a lot of different areas across the United States. We searched for all different age groups and in small and big cities. Once we had our searches, we started looking through the profiles listed and wanted answers to these main questions. Are the profiles filled out by real people? 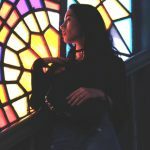 Are their profiles with pictures that are real? Have the members shown been active recently? Do they seem like quality, attractive people? Well, the consensus was pretty unanimous on all of our test searches during our Match.com review. The site was overflowing with real people, with filled out profiles, tons of photos, and the people seemed to be high-quality and attractive. Sure, the last one is based on our personal preference but we’re pretty sure any sane adult is going to be pleased with the quality of the singles on Match. When you use the Discover tab (which we’ll discuss in greater detail in the features section below), you’ll see all of your matches that meet your search criteria in a grid format like the screenshot below. 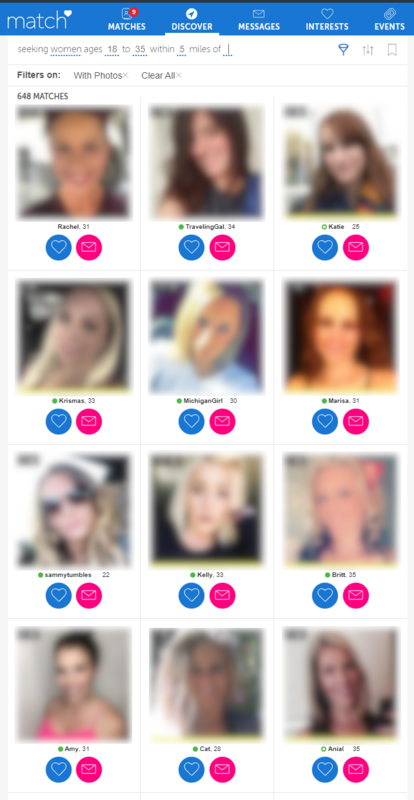 You will notice that we’ve gone ahead and blurred out all of the photos because this is an actual Match.com screenshot. We wanted to protect the privacy of the members in this area. Regarding the different ages, males and females, and locations we checked in our Match.com review, we never had a problem finding a lot of quality matches with every search. Additionally, each person’s profile is attached with an indicator that lets you know if they are currently online, are active, or have been active recently. Basically, it’s a quick way to see if someone is still on the site looking for love or if maybe they’ve found someone and are no longer using the site. It honestly took us several scrolls of the mouse to get past the currently online members to even get to the people that weren’t logged in. If that doesn’t speak volumes to whether the accounts on Match.com are active or not, we don’t know what will. The bottom line of this section of our Match.com review is that they hit it out of the park. The site is overflowing with quality singles who are active and actively engaged in the process. Easiest five stars we’ve given any dating site in this category yet. While we led off with the quality of matches as the first part of our Match.com review, the first place we actually started was with the sign-up process. You can’t see any of the matches until you create an account so obviously, this was first on the list. The entire Match.com sign up process takes about five minutes max. The first thing you will have to fill out is some basic profile admin information. Ugh, paperwork, we know. Don’t worry, it’s really not that bad. It’s literally your email address, password, and your birthday. This screen will also give you your first glimpse into some of your matches in the background. We’ve, of course, blurred them out here to protect their privacy, but you will see them clear as day. They do require you to fill out some information about yourself before they let you start searching through your potential matches. Below, you’ll see a screenshot of what things looked like when we went through and signed up. Once you click on the let’s get started tab, you’re first given a serious of questions to answer about yourself. Don’t like talking about yourself or nervous what Match.com might ask? No fear, we’ve listed out all of the questions for you here. Everything is multiple choice except for the “Tell us a little about yourself question.” That requires a minimum of 100 characters, and there is no way to skip it. Here are the questions you’ll be answering during the “Get to know you” section of the Match.com sign up. You can select any of the criteria from the questions you already answered. When you click on an option, a menu pops up for you to select which criteria in that category you are looking for. You can also select whether that is a deal breaker for you or just a preference. You’ll notice that the last thing you have to do to complete your sign up is upload a picture of yourself. While it may look like you have to upload a photo, there is actually a way to skip this if you don’t feel like uploading something right away. We recommend uploading a picture because it will get you way more attention, but if you haven’t picked one out yet and need a minute we understand. The skip button is somewhat hidden (probably to try and entice you to upload a photo), but during our Match.com review, nothing gets past us. We’ve added a screenshot below to show you where it is in case you want to bypass this for now and get to the matches. The bottom line here is the sign-up process was quick, easy, and didn’t cause bodily harm. Sure, you have to write 100 characters about yourself, but this sentence is over 100 characters, potato. Sorry, had to add a random word in there to click it over the 100 character mark. The point is that 100 characters is literally one sentence. We’d hope that you’d want to take that time to really write about yourself and start building an awesome profile for other singles on Match.com to get to know you. Our Match.com review is off to a pretty great start, but we still have quite a bit that we need to look at. 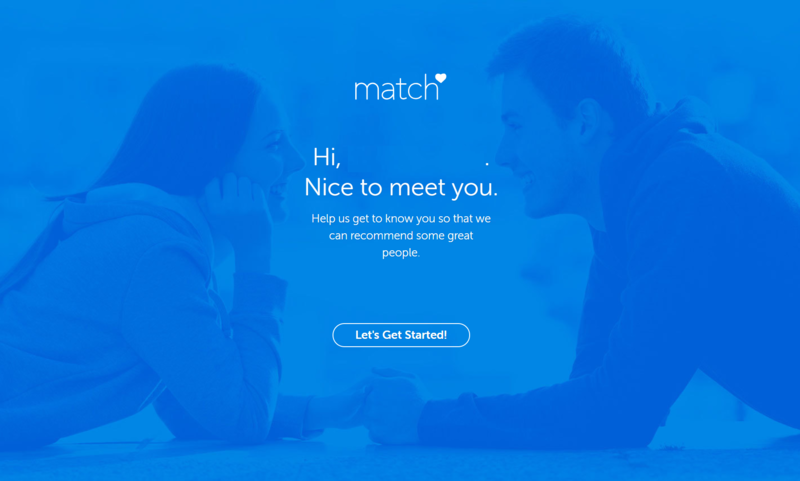 The next thing that we want to take some time to analyze is the user interface of Match.com. Basically, how easy is the site to use? Does it make you want to throw your computer into a swimming pool or does it offer an inviting experience? First, let’s look at the overall feel of the site. During our Match.com review, we found the site pretty dang easy to use. We had no real problems finding the things we were looking for, everything was laid out well, and it was an overall enjoyable experience. 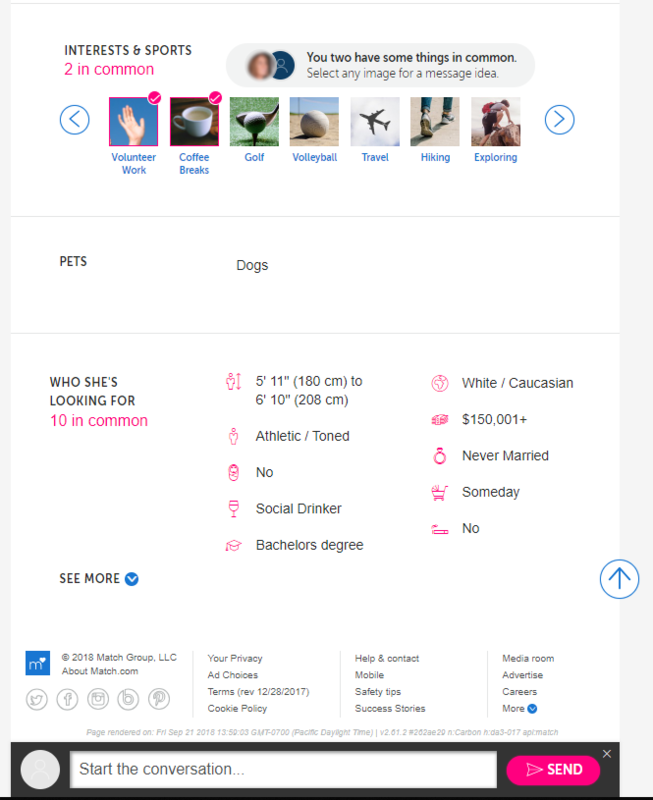 Here’s what the profiles on Match.com look like. Again, we’ve blurred out the photos and personal information. 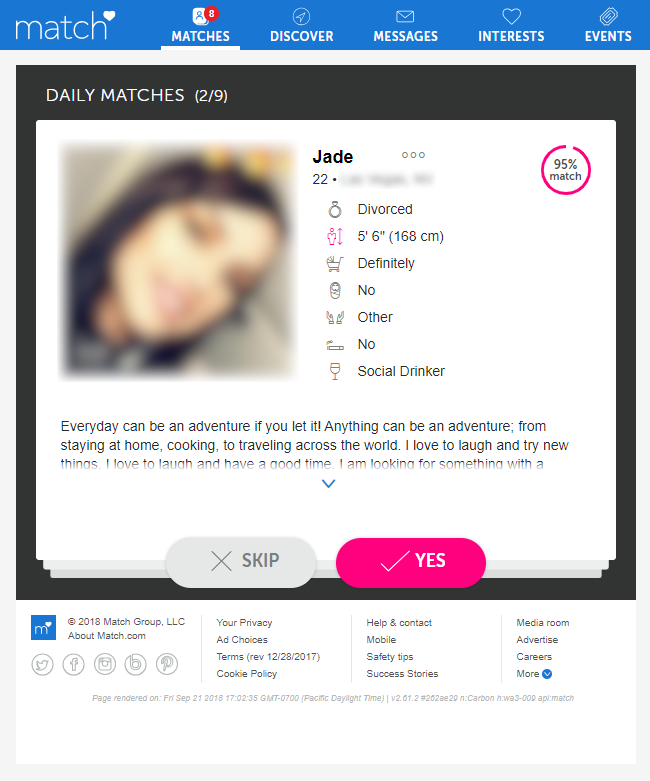 Notice the layout of the Match.com profiles. They’re clean, sleek, and present the information you want to know quickly and organized well. You quickly see their main photo and profile info, and then you can see their photo gallery with all of their other photos down below. If you click on one of these photos, it will pop up in a lightbox so that you can see it larger and clearer. You will notice something a little strange, though. What is Jim Gaffigan doing on Miss Britney’s profile? Is that her dad watching over us? Nope, it’s an advertisement. 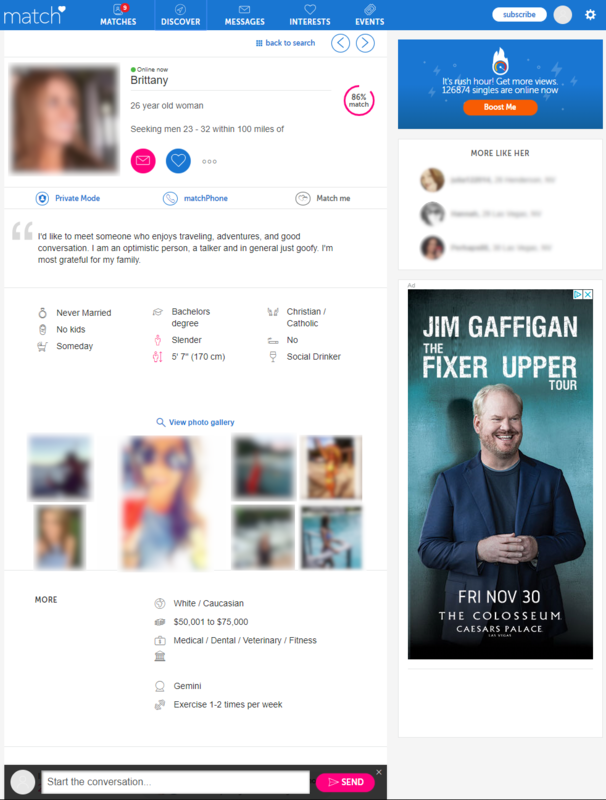 While we think Jim is hilarious, we’d prefer not to see ads while we’re doing our Match.com review or while we’re doing our online dating. The good thing is the ads on Match.com are limited, and they don’t really get in the way. They also seem to be higher quality products and services, so you don’t have to worry too much about seeing something you don’t want to. Still, we’d love to see those nixed from the picture, and that’s why we docked half a start from this section. There is a second half of the profile when you scroll down that shows what the two of you have in common and what they are looking for. Here’s what that looks like. When we get into the features section of our Match.com review below, we’re going to get a lot more into what each of these is and what they have to offer. The bottom line, though, is that Match.com is extremely easy to use. Things are laid out well and organized in a logical, easy to find manner. It would have been another five-star section from us except Mr. Gaffigan had to poke his hilarious little mug into our shot. We love you Jim, just not here. We love great features and our Match.com review certainly did not let us down. The site was jampacked full of some cool features that we think are important for you to check out. While there were too many features for us to list all of them, these were the ones that were our favorites. Mutual Match – People you have liked that have also liked you. Reverse Match – These are matches that are looking for someone like you. (You might not have selected that you’re looking for someone like them). This is pretty awesome because they give you a lot of different ways to search through your matches. If you’re someone who likes to flip through and find something you like, you’re going to like these Match.com options. Additionally, we realized during out Match.com review that Discover doubles as their search function. So, while you aren’t able to put in a bunch of options to search for, you can sort the options that you get based on a lot of different criteria. If you do want to change the options that come up (besides age, gender, and location which you can change right on the page), you can alter the “what you’re looking for” section of your profile. Match.com does something you really don’t see anywhere else in the industry. They attempt to take the online dating experience offline. How? Well, they have what are called Match.com events. The smallest commitment events are webinars where they teach you tips and strategies to be a more successful dater. The next level up are their mixer events where the site hosts an event at a local establishment and invites all the singles on Match.com from that area. There is usually a small cost to go to the event, but you usually get something for it (not to mention the chance to meet someone special). The top of the food chain of Match.com events are their trips. 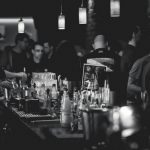 Match has trips all around the world that you can pay to go on where you’ll get to meet other singles while having a blast. Volunteering in Ecuador? 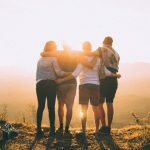 Tanzania camping safari? Lake Tahoe Ski Week? Exploration of Israel? These are just a few of the trips we saw listed the last time we checked the site. One other thing that caught our eye about the events during our Match.com review was that you could attend events in other cities if you were traveling. Out of town on business and have a few nights free? You can change the city on Match.com and search to see if there are any events going on there. If there are, you’re invited! This is a very cool feature. Match.com presents your daily matches to you in a really fun little format. It’s a “tinder-style” presentation, except not as blah as Tinder. Basically, they show you a picture of a match along with a mini-profile of that person. You have the option of clicking Skip or Yes if you’re interested! 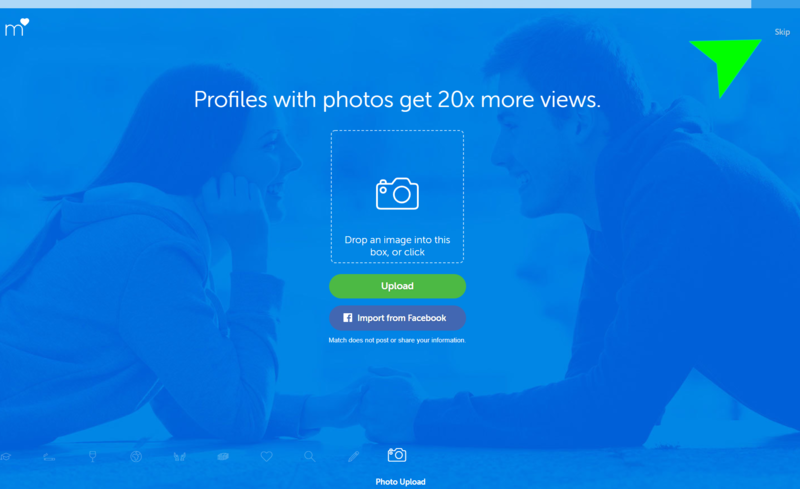 They’ll show your pictures to some of the same people and if you both click Yes, the site will let you know! Even if your potential match doesn’t use this function, it’s still a great way to see your matches not just in a boring list format. Here’s what it looks like. Again, we blurred out things and removed the private information. The customer service section of our Match.com review was another win for the site. While the options were limited, the option they did offer was great. Additionally, they had a fully fleshed out FAQ section that you could search and get a ton of information from. It looks like they spent a lot of time or money getting someone to write out answers to every question under the sun which is awesome. As for contacting them directly, they have live chat available Monday through Friday from 8am to 5pm central standard time (CST). While we would like to see some support available by email and available over the weekend, it’s probably not that necessary in this industry. Overall, the customer support at Match.com looks to be great and more than sufficient. We ended up knocking off a half star just because we would like to see email or an over the weekend option added at some point. Even if they aren’t responding to those weekend requests over the weekend, it would be nice to at least get them into the queue for help. 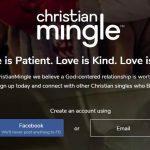 UPDATE: Well, it looks like Match.com beat us to the punch on this one. When the live chat hours close, the option on the website changes to an email option. So, remember that thing we knocked a half star off for? Yea, they are already on top of it. We’ve adjusted them back to five stars for their customer support. Overall another win for Match.com. Price | How much does Match.com cost? The pricing structure at Match.com is split into two plans known as the basic plan or the bundled plan. The bundled plan gets you everything that the basic plan has plus three additional features. What does the basic get you and what are the additional features? We are so glad you asked! Outside of this, the two plans seem to be identical. As you can see (and would imagine), the bundled plan with more features is slightly more expensive than the basic plan. With a 3 month membership, you’re looking at a difference of about $4 a month, with the 6 month membership you’re looking at a difference of about $2 a month, and with the 12 month membership it’s about a 50 cent difference. Is the upgrade worth it? Honestly, for only a couple dollars more a month it’s probably worth it. The ability to know when your messages are read with the read receipts is huge. Anytime we see this option available, we are advocates for picking it up. The first impressions and profile highlighting options are nice, but to us aren’t that important. The read receipts, though, will help keep your mental sanity in check. No longer do you have to sit there worry if they read your message or not. You’ll know for sure and it only costs you a couple bucks extra a month. One additional thing we saw during our Match.com review that we would like to point out is that all accounts are set up for auto renewal. This means that if you don’t uncheck this option your account will automatically be renewed and you will get charged again. This is done for your convenience, but if you don’t want it to happen you can just uncheck the option from your account settings. If you choose to renew, you can just uncheck it prior or just purchase another membership and your account will stay active. 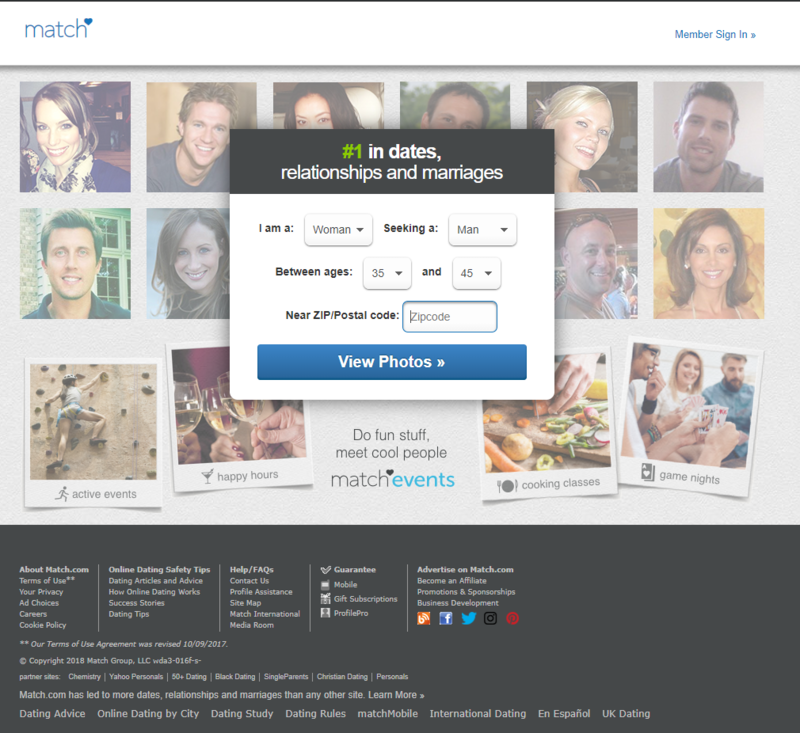 Match.com does offer some additional add-ons that you can purchase to enhance your membership. Let’s take a look at what they have. Top spot is your ability to pay a little extra to be in the top of searches for a period of time. This is a great way for you to jump start your account or get some new interest if things have been a little slower. The feature we really want to talk about is Reply for Free. Here’s something you need to know about Match.com. Free members cannot respond to paid member’s messages. This means that if you message a member and they haven’t paid to upgrade their account, then you’re not going to get a message back from them. But, if you purchase this add on, anyone can respond to your messages free of charge. This opens up a HUGE new number of profiles for you to get in touch with. Honestly, we think this is a worthwhile add-on if you can swing it. While it would be cool to get this on the house, we understand why they don’t do it. They’d lose out on a ton of money and while they are in the business of helping people find love, they are not a charity. Bottom line, look into this power up for sure. Stink at writing profiles? Well, Match will let you pay them to write yours for you. They’ll send you a questionnaire with a bunch of questions (surprise! ), and then they will have a professional writer make your profile for you. Honestly, we think this is cool if you’re completely hopeless, but we have some faith in you. Your profile shows who you are and no one can explain that better than you. We have a free resource here to help if you need a hand. Check out our How to Write the Perfect Dating Profile guide. Pricing wise, we’re pretty pleased with the cost of a Match.com membership. The pricing is actually slightly lower than other dating sites in the same realm, but the quality is certainly not lower. In fact, we’d argue the quality is higher than some of these. So, the million dollar question we’ve been working on answering for you during our Match.com review. Is Match.com worth it? The answer is one of the easiest yesses we’ve ever needed to give. Look, when ti comes to an online dating site you’re looking for three things. You want high-quality, active matches in your area, an easy to use website and app, and a price that doesn’t make your piggy bank run for cover. Match.com is an easy check mark in all three of these columns. Here’s what we recommend. See for yourself! 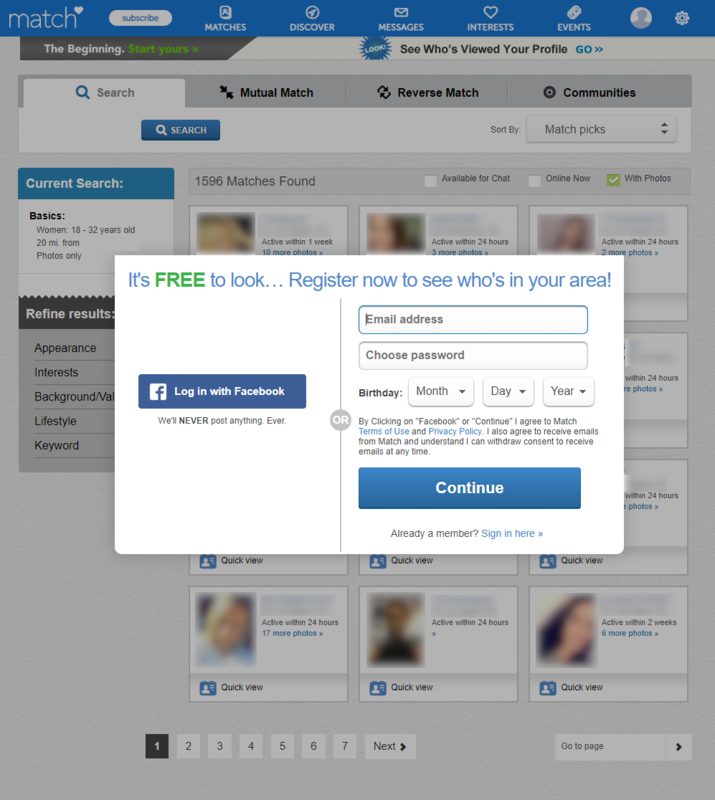 Click the link below and you’ll be able to get a free look around to do your own Match.com review. You’ll be able to test out the features and see all of the potential matches in your area. And, if you do decide that you want to upgrade your account, that link will automatically give you 25% off your membership price!